I found many holiday books to be extremely enjoyable back in the 1980s. However, at a young age, this was by far my most favorite reading material for several Christmas seasons. 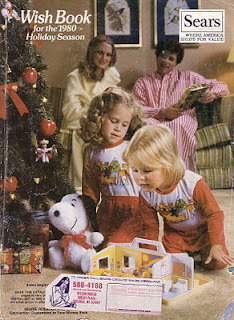 Filled with awesome Barbies, doll houses, even adorable pajamas, the Sears Wish Book catalog was every kid's favorite. How about you? Were you a fan of the Sears catalog? My youngest son made his siblings a personal wish book, of all the toys they actually had when they were young. It was so cool! Yes!! I remember that Sears catalog, and loved them every year, too. I loved the games and Star Wars action figures. I totally agree. I loved the Sears catalog. It had almost every toy available in it. Such good memories! We poured over that book and even made games of it. Oh the memories.